Teaching is based on short cut technique and smart tricks. Mobile App Based Learning – Daily online Assignments & Weekly test with analytics. Video lessons and attendance management system. Study Material – Latest and upgraded study material according to exam pattern. Current Affairs – Special current affairs classes by expert. SSB Orientation – Special sessions by Ex SSB Presidents, Psychologist and GTO. LEARN FROM EXPERTS: Being ONE OF THE Oldest academies The Cavalier has had the distinct advantage of evolving and updating its teaching techniques and infrastructure, Matching the latest developments in SSB interview centers. We have a team of officers who are Ex SSB President, GTOs, and Psychologists from Army, Air Force and Navy guiding you towards success. BEST RESULTS: The Cavalier has the distinct honour of sending the maximum number of candidates to IMA, OTA, NDA, Naval and Air-Force academies. MOCK TEST ON ARRIVAL: The Candidate faces a Mock Test soon after arrival and based on this he is groomed and guided according to his / her needs. IDENTIFYING SHORTCOMINGS: The Cavalier Faculty having SSB Interview Boards experience and over 10 years of teaching experience help students identify their shortcomings through repetitive practice and guidance. Personal sessions with the Interviewing officers and The Psychologist helps the candidate in overcoming those shortcomings. FULL SSB INTERVIEW EXPOSURE: The candidate is put through the entire procedure of SSB Interview, from filling of PIQ form, Screening Test, Personal Interviews and Outdoor Tests. The candidate gets to know the actual of SSB Interview. The fear of unknown is removed silly mistakes and avoided. Minimum Two Groups are always available to the candidate for better interaction and practice. OVERCOMING FEARS: Most of the candidates feel that SSB Interview is extremely difficult. Consequently they start suffering from fear like Public Speaking, Stage Fear, Facing Senior Officers in Personal Interview and their physical structure and ability. The two weeks extensive experience to all the tests of SSB Interview and expert guidance coupled with counseling by EXPERTS at THE CAVALIER removes these fears. 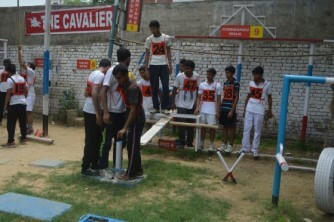 OUTDOOR TASKS: The Cavalier has an extensively bid out OUTDOOR TRANING GRAOUND. The candidates get HADS ON EXPERIENCE. If GOR (Snake Race), Individual Obstacles (IO), Progressive Group Tasks (PGT) and Command tasks (CT). PSYCHOLOGY TESTS & COUNSELLING: All candidates are put through three SIMULATED TESTS on computer for TAT, WAT and SRT after detailed lectures. Each Candidate has PERSONAL COUNSELLING SESSION WITH THE PSYCHOLOGIST to help him overcome his / her problems. PERSONAL INTERVIEWS: Starting with lectures on OLQ (Officer Like Qualities) and Conduct of Interview the Candidate is put through two personal Interviews followed by personal Counselling Repeaters are specially taken care of. REFRESHER COURSE: Only The Cavalier gives you an option of undergoing a three days refresher course, free of cost. Our success rate speaks for itself. FEE CONCESSION: Free SSB coaching for wards of War Widows / Defendants of War Widows. Fee concession for Defence Personnel / their wards, Military School & Sainik School students. Ground Tasks can only he practiced in a ground with real tasks and obstacles. It is a platform where I learned to build my character. It shows you a right path and helps you to achieve your goal.